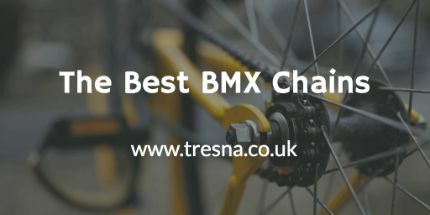 I have ridden BMX and mountain bikes for many years now and a slightly confusing phenomenon is the amount of BMX bike riders that ride their bikes without brakes. Riding brakeless on a BMX has become sort of a trend over the years. It has shifted away from being a solution to a problem and more into the idea of people showing they can ride well while controlling their speed perfectly without the need for stopping power. 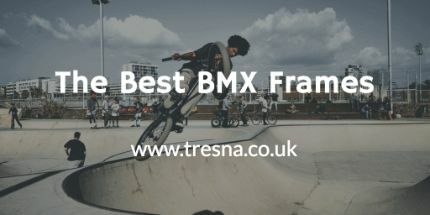 Riding without brakes can help in some senses, such as barspin and tailwhip tricks where the frame/bars have to rotate 360 degrees around each other, where having a brake cable in the way will limit the number of times you can do this without resetting it. Usually though, these days, people will take off their brakes in order to learn control on their bike. Riding a BMX bike with no brakes could get you into trouble with the law. All bikes have to be sold with at least one brake. There are a few different types of brakes that are available for different types of bikes. The two most common are rim brakes and disc brakes, both of which can be split into further categories. 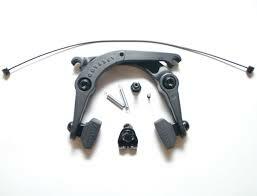 Disc brakes will commonly be seen on mountain bikes where hard braking is a necessity. You can buy mechanical and hydraulic disc brakes for a mountain bike. Mechanical disc brakes look nearly exactly the same as hydraulic brakes apart from the way the pads are pushed against the rim. In this case, a mechanical wire is pulled through a plastic tube by the brake lever. Hydraulic brakes use fluid instead. So when the lever is pulled some brake fluid in the airtight brake tube will push the pads against the disc. Rim brakes are pretty obvious. They are those brakes you will often see on kids bikes, cheaper bikes or BMX bikes. They loop over the edge of the bike's tire and hold rubber pads in place a few millimetres from each side of the rim. Rim brakes usually come either V-Brakes or U-Brakes and there’s only a slight difference. The difference between V and U brakes are primarily the type of bikes they’re used on. 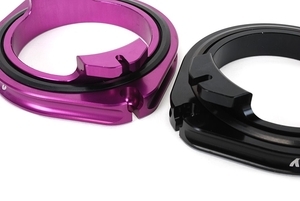 V-Brakes are usually used on race bike frames and other simpler bikes, while U-Brakes are synonymous with BMX bikes as they have a simpler design and get in the way much less. 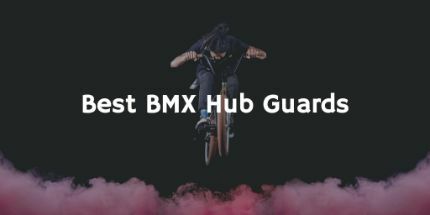 As we know, A lot of BMX riders only ride one or no brakes on their bike, making them less efficient braking system perfectly okay since riders don’t rely on stopping power as much as other bikes. Rim brakes slow the bike down by pushing the pads hard against the rim, thus using the friction to slow down the wheel. I haven’t ever heard of any hydraulic rim brakes and so the brakes themselves are linked to the handlebars through a metal wire that is pulled at the same time as the brake lever. Rim brakes are great for their weight, price and simplicity but you can quickly run into some minor problems when using them. They don't get on well with water due to its slippery nature, Rim brakes can get clogged much easier from being so close to the debris-filled floor and if your wheel is bent even slightly, as most BMX wheels are, braking becomes more difficult and much less efficient. If you’re looking to buy a new BMX brake system there are many out there, I recommend this great one below, the Fly Bikes Springhanger. I want to explain why we call these both ‘Detanglers’ and ‘Gyros’. 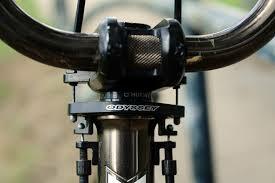 The term Gyro was initially trademarked by Odyssey BMX and so keeping the name for their products only. Obviously, there had to be another name for the products made by other brands and that’s where the term Detangler came from. BMX Gyros / Detanglers are the main reason why anyone saying that riding brakeless allows you to do more tricks is lying. The design of BMX detanglers has come a long way since their inception but a lot of riders still don’t enjoy their use. 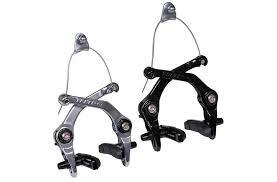 Initially, they were big bits of metal stuck below your stem making your bike heavier and much uglier. The use of the Gyro is to allow the bars to turn 360 degrees around the frame an infinite number of times without the brake cable getting tangled around your stem. Detanglers are nearly exclusively used on the rear brake, this is because the front brake lever turns at the same time as the calliper and so can be threaded through a hole in the stem. How do BMX Detanglers Work? A single brake cable comes out of the lever on the bars. On regular bikes, this cable will stay the same all the way to the brake calliper but when using a detangler the cable will quickly split into two. These cables are then routed to the two opposite sides of the steerer tube. Each end of the inner cables wire will then have a cable stop. These are just round pieces of metal on the end of the cable that allows the cables to be slotted into grooves and not come out of place. You can see it in the images but the detangler itself is the circular pieces of metal that are linked together and rotate around each other attached on the headtube just under the stem. The cable stops mentioned above are slotted into the small metal slits in the upper side of the detangler and so when the brake lever is pulled, the assembly is pulled upwards drawing the bottom section with it and the cables that are attached to the underside in the same manner. The cables are then routed down to the rear brake and are merged back into one at some point along this journey. Technically you could say the cable doesn’t need to be split before going through the gyro but it is done as a best practice since it pulls the gyro rings equally on either side. There are more and more bike gyros and detanglers entering the market all the time, after writing this post that ranks the best of the best, I would recommend this Shadow Sano detangler below. Since there are several different types of BMX brakes we are going to go through the process of installing a rear U-Brake to a BMX. Firstly start by inspecting your frame. You need to check that you have the correct brake mounts for the type of brake you are fitting. Normally you won’t run into any problems but there are some bikes that do not come with fixed brake mounts to it’s a good idea to check. The next step is to attach your callipers to the frame. Keep your wheel on your bike or you’ll struggle to get it back on after installation. Ensure you have the correct calliper side and simply slide it on to the pre-greased brake mounts on either side of the wheel. If you have dust covers you will need to add these over the top of the arm springs followed by the allen bolts that hold the arms in place. These bolts should be tightened now but not completely as there needs to be a bit of movement in the arms when braking. The next step is to align your brake pads to the rim. If they aren’t already fitted to the brake arms do that now, it’s very straightforward and just involves tightening a bolt. Before tightening completely push both sides of the brake calliper onto the wheel rim and align the pads so they follow the curvature of the rim while being in the middle of the surface. Tighten the pads bolts before releasing the arms and you’ll have perfectly aligned brake pads. You can now go about installing the cable hanger and management system. The normal set up for a U-Brake is to have a small length of brake wire that goes from one arm, around the seat tube and attaches to the other brake arm. This wire is then hooked around the cable hanger, which is on the end of the brake wire that runs the length of the bike down from the lever. The hanger that is attached to this wire pulls the looped brake cable, which pinches the arms together, pushing the pads onto the rim. 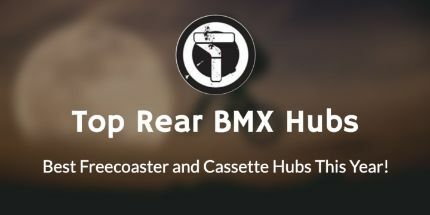 Obviously if you’re going to get rid of your BMX brakes you’re going to need to learn how to stop using other methods. There aren't lots of stopping techniques without the use of a BMX brake. Usually it just comes down to using your feet. 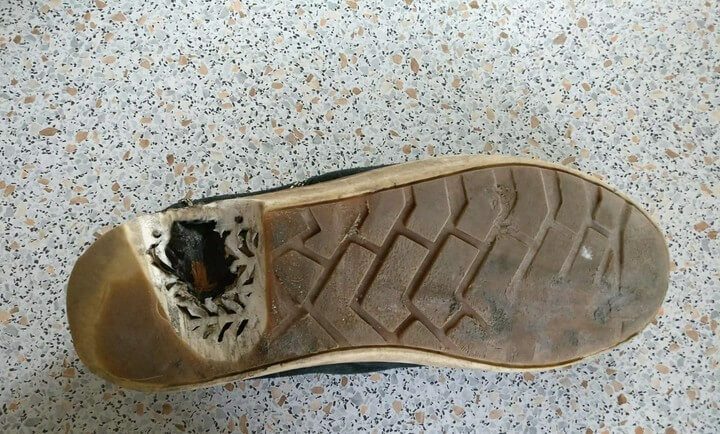 The best way i’ve found to do this is to jam the sole of my shoe into the rear wheel, while resting it on the top of the frames rear triangle. The only other way is to use your toe in your front wheel but this is much more dangerous and can result in much faster stopping thus resulting in the bike placing you on the other side of your bars. 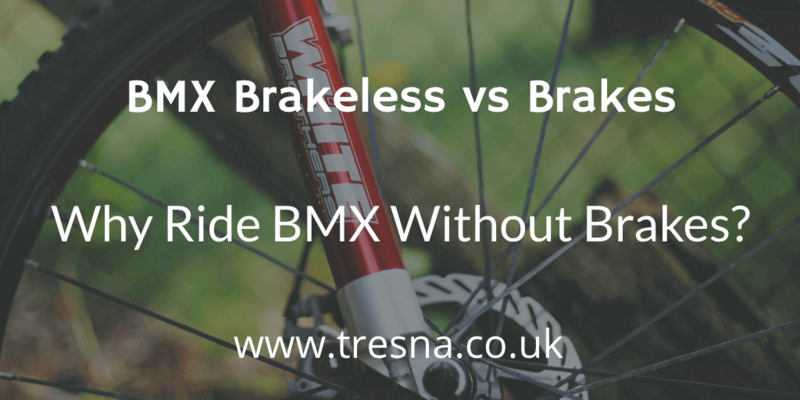 Is it Illegal to Ride BMX Bikes Without Brakes? As for the legality of riding with no brakes, if you ride your BMX bike with no brakes on public roads it’s entirely possible but not certain that you could get a ticket. I believe all complete BMX bikes have to be sold with at least one brake to comply with current laws but if you take that brake off once you receive the bike you will only be legally allowed to ride that bike offroad.